Veteran journalist and author Joseph C. Goulden offers a good review in the Washington Times of Robert P. Watson's The Nazi Titanic. Surely the phrase “friendly fire” ranks among the most sobering words in the military lexicon. In the fog of battle, an artillery spotter plots the wrong target. A rifleman mistakes a friend for an enemy. A fast-flying plane drops bombs prematurely. The result is that a comrade dies unnecessarily. Military history teems with such horrors. In July 1944 alone, during the battle of Normandy, errant bombs killed not only a three-star general, Leslie J. McNair, but 111 other American soldiers. Why these persons died is the subject of a gripping — and disturbing — book by Robert P. Watson, a historian who has authored 36 books. History has pretty much overlooked the tragedy, Mr. Watson writes, because it was “sandwiched halfway between Hitler’s suicide and victory in Europe.” He drew heavily on archives in the Holocaust Memorial Museum in Washington. 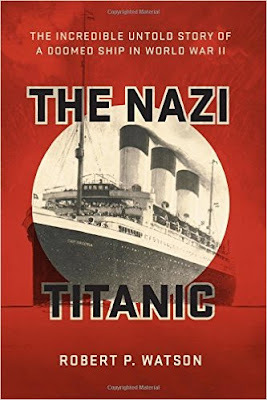 What turned out to be the death ship was a one-time luxury German passenger liner, the Cap Ancona, which in the pre-war years carried 1,325 affluent passengers to South America per voyage. Owners called it “The German Titanic.” When the war began, it was converted into a “floating military barracks” and naval training platform.